"The crown molding certainly has increased the aesthetic appeal of our home by creating warmth and dimension that far exceeded our expectations!" 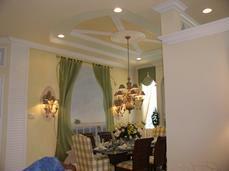 Crown Molding - Crowns are placed along the wall at the ceiling. They come in a wide range of patterns and sizes. Crowns soften the transition from wall to ceiling while adding a distinctive look and charm to your room. Chair Rail - Chair Rails are practical as well as decorative. Applied to a wall, anywhere from 24 to 48 inches from the floor, they protect the wall from scuffs and dents from the backs of chairs as well as adding a beautiful accent to any room. Wainscoting - Trim work installed in the area below a chair rail. Numerous options are available including raised panel, shadow box and bead board. Combined with a chair rail and baseboard, wainscoting creates a dramatic look! 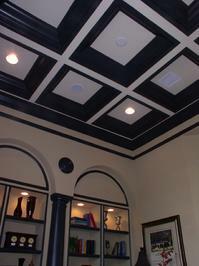 Coffered Ceiling - A coffered ceiling is defined as a ceiling with ornate recessed panels, bordered with trim such as crown molding. Architrave � A decorative header, built up from different styles of trimwork adding a classical formality and continuity to a passageway, doorway or window. Interior Doors - Doors are a versatile, creative way to change your home�s appearance. Upgrading new interior doors to your home can make a huge difference in style and substance for a pretty nominal investment. With French doors you gain the advantage of dividing space but retaining the openness from one room to another. Window & Door Casing � Casings help define the overall character of a room, and are often most visible part of the trim. They are primarily used to cover the gap between drywall and the door or window frame. For more information and ideas on hardwood flooring and architectural moldings, please visit our Distributor's Links page. We are listed in New Jersey Carpenters Directory at Findoha.com or New Jersey Carpenters Directory at Findoha.com.